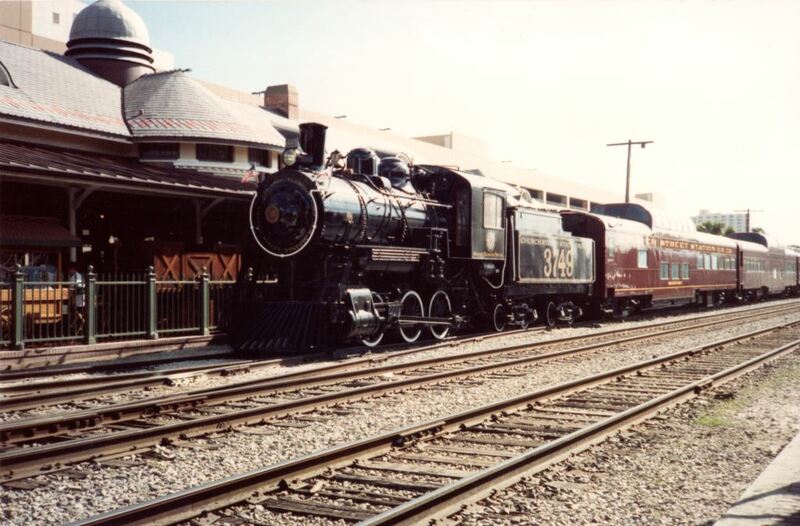 The Orange Blossom Special, the last train at the Church Street Railroad Station, located at 76 West Church Street in Downtown Orlando, Florida, in 1989. The original site was occupied by a railroad depot built around 1883. That building was demolished around 1890 and the current Church Street Station Depot was constructed by the South Florida Railroad on the same lot. The site also served the Tavares, Orlando and Atlantic Railroad and the Orlando and Winter Park Railway. In 1926, the Orlando Health/Amtrak station took over passenger operations, but Church Street Station continued to serve as a ticket outlet and freight station until 1972. 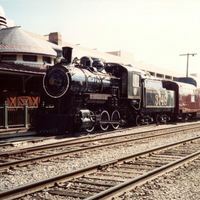 The last train, called the Orange Blossom Special, remained at the station until January of 2012. The 100-year-old engine was transported to the Florida Railroad Museum in Parrish in order to make room for the new SunRail platform. Church Street Station is on the U.S. National Register of Historic Places. Original color photograph, 1989: Private Collection of Nancy Lynn Cepero. Digital reproduction of original color photograph, 1989. Schlueb, Mark. "Orange Blossom Special starts leaving Church Street Station in Orlando"." Orlando Sentinel. January 17, 2012. http://articles.orlandosentinel.com/2012-01-17/news/os-church-street-train-move-20120117_1_church-street-station-sunrail-transport. “Orange Blossom Special, 1989.” RICHES of Central Florida accessed April 20, 2019, https://richesmi.cah.ucf.edu/omeka/items/show/4474.